Updates to Dale's profile since your last visit are highlighted in yellow. Since leaving the mill on October 13, 2006 we have gotten into the retirement mode and wonder how we ever did as much as we did while I was working!! We spend the winters in sunny Arizona and the summers in Beautiful Montana. I still restore "old iron" (gas engines) when I find time, and go to Tractor and Engine shows as often as I can. We have a winter home in a 55 + park and work as Park Hosts part-time while we are here. Boy it sure is nice not to have to shovel snow and drive icy roads. Also I am glad that there are no more frozen fire system lines to thaw out. When we're back home we hope to see all our Mill Friends have a cup of coffee or something and shoot the breeze for a while. Dale DREYER A-RATE PIPEFITTER - FIRE SYSTEMS has a birthday today. 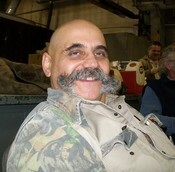 Joe SIMONE A-MECHANIC - DAYS - Pipefitter posted a message on Dale DREYER's Profile.